Shoes. Just saying the word can give this doc goosebumps.Many of my patient families know of my fondness for footwear. It is only natural, therefore, that I often get asked for children shoe recommendations. Most commonly, parents ask me about first shoes for their infants, and early walking shoes for toddlers. My “first shoe” answer often surprises parents. Despite all the seemingly sensible information provided by [insert name of popular child shoe store here], and grandma’s persisting reminder that you wore special walking shoes as a toddler; the fact remains that babies simply don’t need shoes. Shoes don’t help kids learn how to walk. Expensive or “special” shoes are not needed for most kids. And, toddler footwear is more fashion statement than functional tool. What? How can that be? Baby and toddler shoes are everywhere... and they are just so cute! Before you grab the credit card and head to the mall, here are 4 things parents should know about early childhood footwear. 1. Babies don’t need shoes. Babies learn to walk on bare feet. Achieving gross motor (big movement) milestones during the first year of life is a complicated progression involving the muscular and nervous systems. During this predictable pattern of growth, an infant needs to be able to learn different sensations and movements unhindered by shoes. Babies like to play and “eat” their feet. They need to curl, wiggle, bend, and spread their toes to work the small muscles of the feet. They need to feel their stable footing on the ground as they are cruising around furniture. And, those first steps are most solid when the whole foot is touching safe ground. So, at home and other safe play places, keep baby out of shoes. 2. The arch of the foot takes time, not shoes, to develop. Toddlers are flat-footed. And, that’s OK. The ligaments of the foot that create the arch are loose and flexible until the age of 5-10 years, at which time the appearance of a foot arch begins to naturally develop.Many studieshave been done to determine if supporting the midfoot (an arch support) during early foot development will speed up the development of the arch. Studies such as these do not support the need for any footwear to develop a healthy or “normal” foot arch. In fact, flat feet are less common in societies that do not wear shoes in childhood. Having “flat feet” tends to run in families. In addition, flat-footedness is more correlated withlack of physical activityand increased body weight, than lack of footwear. 3. Shoes will not improve a child’s out-toeing or in-toeing, nor help with ankle strength. Most toddlers have a very wide stance and short lower limbs. They walk with flexed hips and flexed arms. As a result, most toddlers have the appearance of being “bow-legged” or in-toeing/out-toeing. As a child’s nervous and muscular systems mature, the foot-strike and gait becomes more like that of an adult. This slow process takes years to naturally occur, usually by the age of 7 years. During the childhood years, leg bones naturally remodel, strengthen, and align. As the bones of the leg and foot mature, so will the appearance of a child’s legs and feet. This process is completely independent of footwear. Unless your child is unable to walk due to foot positioning; corrective shoes/inserts are not necessary for toddlers. 4. A shoe is simply meant to protect the bottom of the foot. No more, no less. If your baby or toddler is going to be in a place where they could step on something very hot, cold, splintery, bumpy, or sharp... They need shoes! Choose shoes that are flexible and thin-soled. For example, leather-soled shoes for earliest walkers are a good choice. A flexible, hard sole shoe will be needed by the time your toddler is running. When shopping for toddler shoes, bend the shoe in half. The shoe should bend in the middle. If the shoe bends at the “ball” of the foot, then there is some arch support in the shoe. A toddler has to walk stiffly and unnaturally in a shoe with arch support, so look for a different shoe. 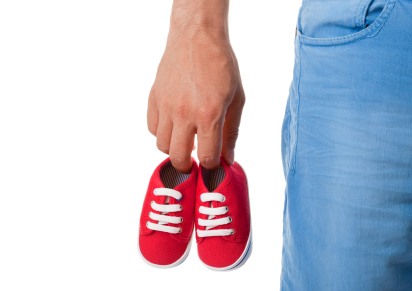 The baby shoe bottom line: Don’t be mislead by clever baby-shoe-company marketing. Shoes simply protect a toddler’s foot from the elements. So when spending the bucks for sparkly Tom’s, baby Nikes, tiny Crocs, neon jelly shoes, or toddler Chuck Taylors; understand toddler shoes are more fit for the fashion runway then your driveway. And, of course, for visits to your shoe-envious pediatrician!